The 2014 Seattle Sockeye season will begin Saturday, May 10th at the Magnuson Sports Meadow from 10am-4pm with our Open Tryouts. 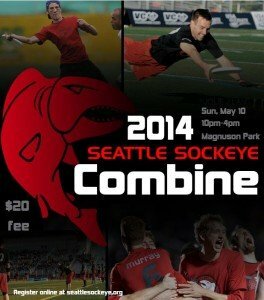 The Sockeye Combine Tryout will include a full day of drills, scrimmages, games and high-level ultimate action for any and all ultimate frisbee players and enthusiasts. It will also represent the only Open Tryout opportunity for players looking to make a charge into closed tryouts and a spot on the final roster. Click here to sign-up for the Combine and enjoy a day of swimming with The Fish! Coming off of a finals appearance at the USAU Club National Championships in Frisco, TX, Sockeye will be looking to come out with intensity and focus. 2014 will be an incredible year as The Fish will be heading to Lecco, Italy in August to participate in the World Ultimate Championships representing as one of the four US teams in the Open Division. Throw in a trip to the US Open in Minneapolis, a stop in Santa Cruz, CA for the Labor Day Ultimate Championships and an eventual return to the USAU Series which includes another chance at the USAU Championships. Interested tryout player should also fill out the Player Profile doc here. Follow us on Facebook and Twitter for Combine, tryout and season updates!! !